If you search the .net, you will find tens of bands called Lycanthropy. I for myself do like several acts with that name, but the one from Russia / Ukraine must be one I like most. ‘Like’, can you imagine I am using that word… Anyway, on December 1st 2014 Concreteweb did upload the review undersigned did for the Dead Silence-EP, which I got from Metallic Media, and since then, this three-piece (gathered around two permanent members) recorded / released some more stuff. Amongst that material, the Operation Werwolf-MCD / EP, which lasts for fourteen minutes (how sad), and which got registered almost completely at the home studio of vocalist / lyricist Furious. 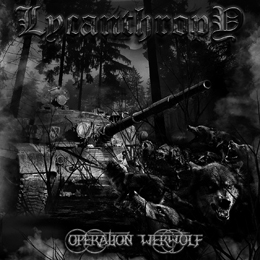 Operation Werwolf is quite the same as before, yet with some subtle rearrangements, like the lyrical approach and the increased technical execution. This band is quite productive, but this release might be the most mature one to date. After the grim, suffocative and little bizarre industrialised introduction Entrance, this EP brings a handful of rather short yet extremely intense, morbid, malignant and nasty blackened pieces that are rather to be defined as war hymns. Especially the first half is extremely speed-up, intense and sardonically marching forward, with an approach that might be comparable to the one from the mid / late-nineties Swedish scene. The second half comes with somewhat slower, more epic compositions, rather rooted within the tradition of the Pagan / Viking scene, and that’s something new / renewing. But believe me if I say that Lycanthropy do a great job with this approach! Remember the slower songs of Gorgoroth at their era late-nineties? Well, this is exactly what I am talking about: massive and merciless, but at the same time sublime and well-crafted. The outro, though not that otiose, brings nothing additional. But in each case one can proudly say that this (way too short) effort is something to search for!